The Palio of Siena and Contradas’ museums open the doors to visitors. Borgo Grondaie has decided to talk about these museums and their value for Siena citizens. Siena is a city rich of history, art, culture and of course museums. However, particular attention should be given to this specific category present only in our city: the contradas’ museums. It is a unique heritage that you cannot find anywhere else. The contrade in Siena are 17, each of which corresponds to seventeen subdivisions of the historic city within the medieval walls. They are: Eagle, Caterpillar, Snail, Owl, Dragon, Giraffe, Hedgehog, Unicorn, She-Wolf, Shell, Goose, Wave, Panther, Forest, Turtle, Tower and Ram. Each district has its headquarter in which the core is represented by the museum. Inside it you can find lots of rooms used for assemblies and reception. 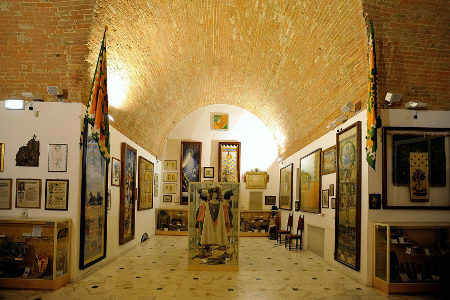 Here you can admire memorabilia, memories and various trophies, the “Drappelloni” (the big paintings) won and “Masgalani”, (the Masgalano is the prize that is awarded to the contrada whose historical promenade is considerated the best in elegance, poise and coordination during both pageants preceding the Palio), the old and the new costums used during both parades, ancient flags, furniture and works of art. The most beautiful room is undoubtedly the Hall of Victories, often used as a hall of meetings of the General Council of the contrada. Each museum is subject to periodic renewal according to taste and the changing times. Linked to the museum are the record office and archive in which all the books of the resolutions and correspondence, the accounting documents and administration are kept. There are also other rooms where the rods and flags are stored together with shoes, costumes, drums and everything used during the Palio. Then detached from the museum environments there is the stable for the horse, a sacred place during the days of Palio! 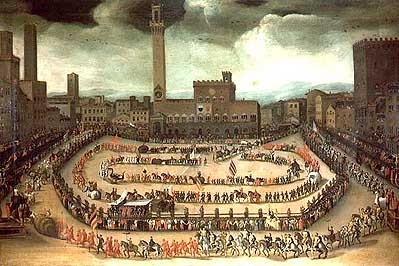 The Palio of Siena and contradas’ museums are recognized examples of medieval traditions. In this regard it seems interesting to recall some small historical references. The Palio happens every year on July 2nd and August 16th. With regard to contradas‘ origins, for someone they are dated back to the Military Companies that defended the city in the battles of the ancient Republic. For others, their birth is linked instead to gaming events typical of the Middle Ages. In the past we had even 80 contradas but from 1729, when the governor of the city, the Serenissima Violante Beatrice of Bavaria, set the bounds precise (still valid today), are 17. Today the life of each contrada has taken different forms but the values ​​of solidarity and their prestige to defend is the same, both in the Palio and in the many events linked to it. It is interesting to note, also, that before ‘600 the Palio was run “in the long run” through the streets of the city and without jockeys. Later, in the mid-seventeenth century, it began to run it “round”, or in Piazza del Campo as nowdays. In 1701 the Palios became two, July 2 and August 16 both in honor of Jesus mother. Returning to speak of the importance of the Palio and Contradas’ museums we cannot forget the Society of contrada, born in the late nineteenth century with the purpose of mutual aid and support of their members against accidents, poverty, disease, old age and illiteracy. The Societies, however, knew moments of decline, broke up and reform, taking recreational functions. In particular, they opened the evening and on holidays and represent the place to meet each other, to play cards, billiards, bingo and to socialize. They often organized dinners and meetings and, as now, it is a moment totally dedicated to speak about the Palio, singing folk songs and organize recreational activities. Today the aim of contrada Societies is to strengthen relations between supporters promoting recreational activities, cultural and sports. Borgo Grondaie only 2 km away from Siena City Centre is the ideal location for visiting the town and discovering our traditions. Visit our website to find the best offer ever!